Most of the actions that people take for granted are the result of a set of complex decisions that the brain deals with. The decisions about how to aim the body, how hard to hold handles, and how to raise cups are something that no one often consciously thinks of, yet the brain does all of these without missing a beat. A new Northwestern University study shows that not only does the brain handle such complex decisions, it also hides this information from the conscious mind. The scientists published their findings in the journal Perception. 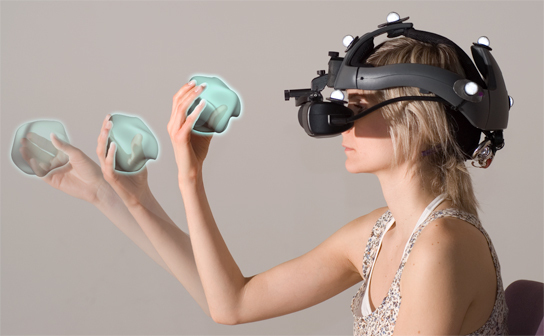 When you pick up an object, your brain automatically decides how to control your muscles based on what your eyes see, states Yangqing Xu, lead author of the study and doctoral candidate in psychology at Northwestern. When you pick up a mug with your right hand, you need to add a clockwise twist to your grip in order to compensate for the extra weight you see on the left side of the mug, she continues. We explore objects to familiarize ourselves with their visual aspects. The researchers showed that the use of this visual information is so powerful and automatic, that humans cannot turn it off. When people see an objected weighted in one direction, they can’t help but feel the weight in that direction, even when the researchers tricked them. In the scientists’ first experiment, people were asked to grasp a vertical stick with a weight hanging from its left or right side. People easily reported which side they felt the weight was on, even when they closed their eyes. 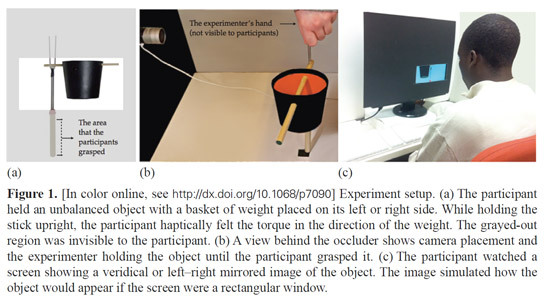 Then, the researchers used a set of mirrors to occasionally flip the view of the object, so that it looked like the weight was on the other side. Although people were able to report on which side they felt the weight, the visual image strongly influenced the direction they felt that the weight was coming from, especially with lighter objects. While researchers experimented with trying to convince their subjects the nature of the trick, people could still not ignore the visual information. It even worked on the researchers themselves, who designed the experiment. The brain is constantly making decisions that people don’t know about or don’t understand. The decisions are logical and based on vast experience. Be the first to comment on "Humans Are Less in Control of Their Brains Than Previously Thought"